the US, Canada, New Zealand and Worldwide. For a family sailing break try one of the Eurocamp parcs near a suitable beach, or one with watersports on-parc. Offering a great introduction to a range of watersports with qualified instruction – plus a discount for Eurocamp customers. Sailing and multi-sport watersports centre on the shores of Loch Insh in the Cairngorms' National park, offering a range of water based activities including: sailing, windsurfing, raft building, stand-up-paddle boarding, canoeing and kayaking, rowing, pedalos, boat trips and salmon fishing on the Spey. Accommodation in cozy B&B bunkhouse or log chalets with hot tubs. The British Offshore Sailing School; offers a wide range of RYA sailing and yachting courses from their UK yachting base and various overseas locations. – courses suitable for beginners through to expert RYA Ocean Yachtmaster. Specialised sailing and learn to sail courses in Greece for all levels; the sailing school is Royal Yachting Association (RYA) recognised and offers both RYA and non-RYA sail training courses. A family business offering a broad range of watersports holidays in Poole Harbour, Dorset, and in France. Dinghy sailing courses at all the recognised RYA levels, from Dinghy Start for those with no previous sailing experience; through to Dinghy Explorer for people wanting to extend their knowledge and learn to undertake short open boat cruises or sail in difficult weather conditions. Courses are run by UKSA (UK Sailing Academy), a registered charity dedicated to life change through maritime training and education. The courses are residential and include on-site accommodation, food, instruction and use of personal safety gear.. This section lists day sailing and small dinghy sailing holidays and multi-day residential courses, in the UK and Worldwide. Listing day sailing either simply as a fun holiday activity; as learn-to-sail courses (e.g. basic sailing skills, seamanship skills and helmsman courses); or training courses offering recognised qualifications such as the RYA 'competent crew' or 'day skipper' courses, or their equivalents in other parts of the world. We define 'day sailing' as sailing aboard a small sail boat, yacht or dinghy; generally a craft under about 6 m (20 ft) in length and frequently without any sort of cabin. These will be boats designed for recreational day use and will not have space or facilities for sleeping aboard. Day sailing courses and packages will often provide shore based accommodation as part of a package. 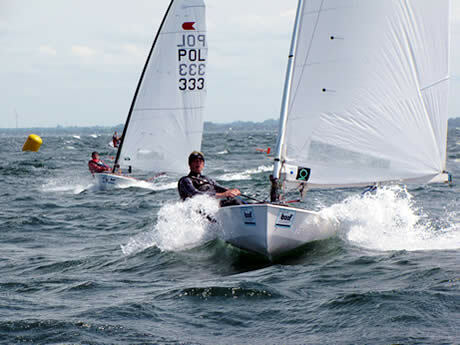 There are a huge number of dinghy sailing classes, but some of the typical classes you might come across on holidays and sailing courses are the Laser, Finn, Wayfarer, Topper and RS classes. Qualifications to look out for; in the UK the RYA (Royal Yachting Association) is the national governing body for the activity. They oversea a huge range of training courses and qualifications for coaches, trainers, instructors and those taking part. You'll find RYA approved sailing schools and RYA qualified instructors throughout the UK and well as abroad in popular sunny holiday spots..
For bigger boats, sailing ships and yachts and live-aboard sailing holidays check out our large boat/yacht section here». The travel-quest dinghy and day sailing holidays section lists holidays and courses focused on day-sailing courses and holidays on small yachts and dingies. See the definition at further up the page for more details.